Bacterial lipopolysaccharide (LPS) triggers innate immune responses through Toll-like receptor (TLR) 4, a member of the TLR family that participates in pathogen recognition. TLRs recruit a cytoplasmic protein, MyD88, upon pathogen recognition, mediating its function for immune responses. Two major pathways for LPS have been suggested in recent studies, which are referred to as MyD88-dependent and -independent pathways. We report in this study the characterization of the MyD88-independent pathway via TLR4. MyD88-deficient cells failed to produce inflammatory cytokines in response to LPS, whereas they responded to LPS by activating IFN-regulatory factor 3 as well as inducing the genes containing IFN-stimulated regulatory elements such as IP-10. In contrast, a lipopeptide that activates TLR2 had no ability to activate IFN-regulatory factor 3. The MyD88-independent pathway was also activated in cells lacking both MyD88 and TNFR-associated factor 6. Thus, TLR4 signaling is composed of at least two distinct pathways, a MyD88-dependent pathway that is critical to the induction of inflammatory cytokines and a MyD88/TNFR-associated factor 6-independent pathway that regulates induction of IP-10. The recognition of pathogens is mediated by a set of germline-encoded receptors that are referred to as pattern-recognition receptors. These receptors recognize conserved molecular patterns (pathogen-associated molecular patterns or PAMPs)3 shared by large groups of microorganisms (1, 2, 3). This recognition system is not only responsible for the first-line microbial clearance but also plays an instructive role in the adaptive immune response through release of inflammatory cytokines and expression of costimulatory molecules by APCs. Recently, the family of Toll-like receptors (TLRs) has been found to function as pattern-recognition receptors. The TLR family is now comprised of at least 10 members in mammals (4, 5, 6, 7, 8). One of the PAMPs recognized by a member of the TLR family is bacterial LPS, a major component of the outer membrane of Gram-negative bacteria. In mammals, macrophages and monocytes primarily respond to LPS and release inflammatory cytokines such as TNF-α, IL-6, IL-1β, and chemokines (9). The cellular response by LPS occurs through interaction of LPS with a circulating LPS-binding protein and CD14, a glycosylphosphatidyl inositol-linked surface receptor, and subsequent activation of TLR4. TLR4 has been genetically identified as a signaling molecule essential for the responses to LPS (10). Furthermore, mice with targeted disruption of the TLR4 gene are LPS unresponsive (11). In contrast to TLR4-deficient mice, TLR2-deficient mice are LPS responsive, but are unresponsive to Staphylococcus aureus peptidoglycans and macrophage-activating lipopeptide-2 kDa (MALP-2) derived from Mycoplasma fermentans, indicating the different roles of the TLR family in the recognition of different PAMPs (12, 13). TLRs consist of two major domains characterized by extracellular leucine-rich repeats and an intracellular region belonging to the IL-1R family (14). Therefore, it is considered that TLRs use the same signaling components as those in the IL-1R. Ligation of IL-1 to the cell-surface receptor results in recruiting an adapter molecule MyD88 to the receptor (15, 16, 17). A serine/threonine kinase IL-1R-associated kinase (IRAK) is subsequently recruited, becomes phosphorylated, dissociates from the receptor complex, and associates with TNFR-associated factor (TRAF) 6 (18, 19). This subsequently leads to the activation of two different pathways involving the c-Jun N-terminal kinase (JNK)/p38 mitogen-activated protein (MAP) kinase family and the Rel family transcription factor NF-κB. Our previous studies with MyD88-deficient mice showed that this molecule is indispensable for the responses to IL-1, IL-1-related cytokine IL-18, LPS, and MALP-2, demonstrating that MyD88 functions as a general adaptor molecule for the IL-1R/TLR family (13, 20, 21). However, the difference between TLR2 and TLR4 signalings has been suggested. In MyD88-deficient macrophages, production of IL-1β, TNF-α, and IL-6 in response to LPS and MALP-2 was completely impaired. However, LPS stimulation of MyD88-deficient macrophages activates NF-κB and JNK/p38, although this activation is delayed when compared with wild-type (21). In contrast, NF-κB activation by MALP-2 stimulation is completely abolished in MyD88-deficient macrophages (13). These results suggested the existence of MyD88-independent pathway(s) that lead to NF-κB and JNK/p38 activation in TLR4 signaling. In the present study, we demonstrate that activation of IFN regulatory factor (IRF) 3, as well as induction of IFN-inducible genes, is regulated by the MyD88- and TRAF6-independent pathway in TLR4 signaling. Escherichia coli-type synthetic lipid A (compound 506) was purchased from Dai-ichi Pure Chemicals (Tokyo, Japan; Ref. 21). MALP-2 was synthesized as described previously (13). MyD88-deficient and TLR4-deficient mice were generated and maintained as described previously (11, 20). Age-matched mice were used for all experiments. C3H/HeN and C3H/HeJ mice were obtained from SLC (Shizuoka, Japan). Peritoneal macrophages were purified 4 days after 2 ml of 4.0% thioglycollate injection of mice. Ab against mouse IRF-3 was as described previously (22). Anti-IκBα, anti-CREB-binding protein (CBP), anti-p300, and anti-JNK1 Abs were purchased from Santa Cruz Biotechnology (Santa Cruz, CA). Anti-IRAK1 Ab was provided by Hayashibara Biochemical Laboratories (Okayama, Japan). Pyrrolidine dithiocarbamate (PDTC) was also purchased from Calbiochem (San Diego, CA). Recombinant TNF-α and IL-1β were purchased from Genzyme (Cambridge, MA). E13.5 embryos were dissected, cut into small pieces, and soaked for 30 min in 5 ml 0.25% trypsin EDTA at room temperature with shaking and then inactivated with DMEM supplemented with 10% FBS. The cells were then suspended by pipetting, plated on two 10-cm dishes per embryo, and cultured in DMEM supplemented with 10% FBS. Cells cultured during days 3–5 were used for experiments. Subtraction was performed essentially according to the manufacturer’s instructions for the PCR-select subtraction kit (Clontech Laboratories, Palo Alto, CA) (23). In brief, 1 × 108 peritoneal macrophages from MyD88-deficient mice were stimulated with 1.0 μg/ml lipid A for 4 h. Cytoplasmic RNA was extracted by guanidine isothiocyanate-cecium chloride gradient centrifugation. Poly(A) + RNA was purified using oligo-dT30 latex beads (Takara Shuzo, Kyoto, Japan). cDNAs were synthesized from 2.0 μg of poly(A) + RNA from lipid A-stimulated cells for tester and 2.0 μg of unstimulated cells for driver. Following RsaI digestion, adoptors 1 and 2R were ligated to the tester. Tester cDNA was hybridized with excess driver cDNA. After hybridization, differential cDNAs were selectively amplified by suppression PCR. Nested PCR products were ligated into a pGEM-T vector (Promega, Madison, WI). A subtracted library was constructed and independent clones were amplified by colony PCR. Differential screening against 500 clones was performed according to the manufacturer’s instructions (Clontech Laboratories). Total RNA was extracted using the TRIzol reagent (Life Technologies, Gaithersburg, MD). Total RNA was electrophoresed, transferred to a nylon membrane, and hybridized with cDNA probes as described previously (20). cDNA probes specific for IFN-γ-inducible protein 10 (IP-10), glucocorticoid attenuated response gene (GARG) 16, and immune-responsive gene 1 (IRG1) were obtained from the subtractive screening. Probes for IL-6 and TNF-α were described previously (21). The cyclooxygenase (COX)-2 probe was amplified by RT-PCR from LPS-stimulated mouse peritoneal macrophages. The nuclear extracts of peritoneal macrophages (5 × 105) were purified after lipid A or MALP-2 stimulation as described previously (20). The extracts were incubated with a specific probe for the IFN-stimulated regulatory element (ISRE; 5′-GATCCATGCCTCGGGAAAGGGAAACCGAAACTGAAGCC-3′) found in the ISG15 gene (24) or NF-κB (5′-ATCAGGGACTTTCCGCTGGGGACTTTCC-3′) DNA-binding site, electrophoresed, and visualized by autoradiography as described previously (20). Peritoneal macrophages seeded on glass plates at a density of 20,000 cells/ml were stimulated with 1.0 μg/ml lipid A for 4 h. The cells were washed twice with PBS before being incubated in a mixture of 3.0% paraformaldehyde and 0.3% Triton X-100 in PBS for 5 min to simultaneously fix and permeabilize, and then incubated in 3.0% paraformaldehyde for 20 min. The cells were washed three times in PBS and, following blocking with 3.0% BSA, then were washed in PBS for 60 min. The cells were incubated with anti-IRF-3 Ab for 60 min. They then were washed three times in PBS and incubated with biotinylated anti-rabbit Ig Ab (Vector Laboratories, Burlingame, CA) for 30 min. After washing, the cells were incubated with avidin-FITC (BD PharMingen, San Diego, CA) and 0.5 μg of 4′,6-diamidino-2-phenylindole (Wako, Osaka, Japan) for an additional 30 min. The glass plates were washed four times in PBS, and drained. Microscopy analysis was conducted under the conditions of fluorescent light. The nuclear extracts were separated on SDS-PAGE, transferred onto a nitrocellulose filter membrane, and incubated with the blocking buffer containing 5.0% skim milk. The filter was incubated with the indicated Ab before being washed three times in TBST and then incubated with anti-rabbit peroxidase-conjugated secondary Ab (Amersham Pharmacia Biotech, Chalfont, U.K.). After further washing with TBST, peroxidase activity was detected by using the ECL system (DuPont Pharmaceuticals, Boston, MA). EF cells (1 × 105) seeded on a 6-well plate were transiently cotransfected with 1.0 μg reporter gene plasmid (pNF-κB Luc) together with 0.1 μg of pRL-SV40 by lipofection. After 24 h of transfection, cells were stimulated with 1.0 μg/ml lipid A, 30 ng/ml MALP-2, 10 ng/ml IL-1β, or 10 ng/ml TNF-α for 8 h. The relative NF-κB activity was determined and normalized on the basis of sea pansy luciferase activity as described previously (20). EF cells stimulated with 100 ng/ml lipid A were lysed and immunoprecipitated with anti-IRAK Ab, then the kinase activity was measured by in vitro kinase assay as described previously (21). The cell lysates were immunoprecipitated with anti-JNK1 Ab, then an in vitro kinase assay was performed using GST-c-Jun as the substrate as described previously (20). To search for genes activated upon LPS stimulation in a MyD88-independent manner, we prepared a cDNA library from MyD88-deficient peritoneal macrophages with or without lipid A stimulation and performed the suppression-subtractive hybridization. The screening identified several genes that are induced in MyD88-deficient macrophages upon stimulation with lipid A. Sequence analysis of these clones revealed that most were identical to the gene encoding IP-10, a family of CXC chemokines. Other than IP-10, GARG16 and IRG1 were obtained by this screening. These genes were reported to be induced upon stimulation with IFN (25, 26, 27, 28, 29, 30). Consistent with our previous study with MyD88-deficient mice, neither gene coding for TNF-α, IL-6 nor IL-1β was obtained in this screening. We therefore examined the expression of IP-10, GARG16, and IRG1 in response to lipid A in wild-type, MyD88- and TLR4-deficient macrophages. Thioglycollate-elicited peritoneal macrophages were treated with 1 μg/ml lipid A for 4 or 8 h and expression of these genes was examined by Northern blot analysis. As shown in Fig. 1⇓A, mRNAs for IP-10, GARG16, and IRG1 were significantly induced in response to lipid A in both wild-type and MyD88-deficient macrophages. In contrast, induction of these genes was not observed in TLR4-deficient macrophages. 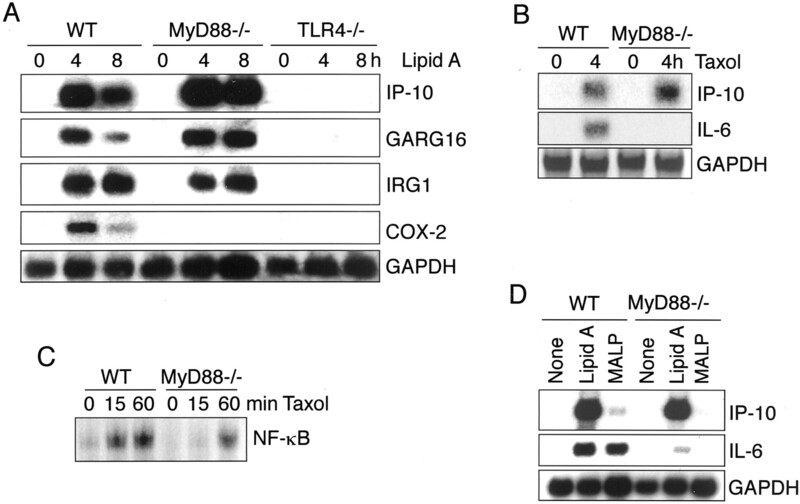 These results indicate that MyD88 is dispensable for lipid A-induced expression of these genes, although TLR4 is essential to these inductions. In contrast, lipid A induction of the COX-2 gene was completely abolished in MyD88-deficient macrophages. Induction of IFN-inducible genes in response to lipid A in MyD88-deficient macrophages. A, Thioglycollate-elicited peritoneal macrophages from wild-type, MyD88-deficient, and TLR4-deficient mice were stimulated with 1.0 μg/ml of synthetic lipid A (compound 506) for 4 or 8 h. Total RNA (5.0 μg) was electrophoresed, transferred, and hybridized with 32P-labeled probes specific for IP-10, GARG16, IRG-1, COX-2, or GAPDH. B, Peritoneal macrophages from wild-type and MyD88-deficient mice were stimulated with 10 μM Taxol for 4 h. Five micrograms of total RNA were subjected to Northern blot analysis using cDNA probe for IP-10 or IL-6. GAPDH was used for an internal control. C, Peritoneal macrophages from wild-type and MyD88-deficient mice were stimulated with 10 μM Taxol for 10, 30, or 60 min. Nuclear extracts were then prepared and EMSA was performed using NF-κB as a probe. The result was representative of two independent experiments. D, Total RNA was extracted from wild-type or MyD88-deficient peritoneal macrophages after 4 h stimulation with 1.0 μg/ml lipid A or 3.0 ng/ml MALP-2. Five micrograms of total RNA were subjected to Northern blot analysis using a cDNA probe for IP-10 or IL-6. GAPDH was used for an internal control. We next investigated whether or not MyD88-independent signals are also activated in response to other stimuli using TLR4. Taxol, an antitumor agent derived from a plant, is known to mimic LPS in mice, although its structure is unrelated to that of LPS (31). It has been shown that the action of Taxol completely depends on TLR4 (31, 32, 33). Stimulation with Taxol induced IP-10 (but not IL-6) in MyD88-deficient macrophages as did LPS (Fig. 1⇑B), raising the possibility that the MyD88-independent pathway could be transmitted from TLR4. In addition, stimulation with Taxol resulted in the delayed activation of NF-κB in MyD88-deficient macrophages as did LPS (Fig. 1⇑C). We next used MALP-2 that activates macrophages via TLR2 and investigated its ability to induce the IP-10 gene. As shown in Fig. 1⇑D, stimulation with lipid A induced strong expression of IP-10 mRNA in both wild-type and MyD88-deficient macrophages, whereas the IP-10 gene was only slightly induced in response to MALP-2 and its induction is MyD88-dependent. In contrast, IL-6 mRNA was induced in wild-type macrophages after MALP-2 stimulation to the same extent as lipid A stimulation. However, IL-6 mRNA induction was dramatically decreased in lipid A-stimulated cells and completely abolished in MALP-2-stimulated cells from MyD88-deficient mice. These results demonstrate that IP-10 gene expression is regulated mainly by TLR4-dependent and MyD88-independent pathways. Previous reports indicated that expression of IP-10 is regulated in part by the IRF family of transcription factors, and the promoter region of the IP-10 gene contains typical ISRE and NF-κB-binding motifs recognized by IRFs and NF-κB, respectively (25, 34). Therefore, we investigated the ISRE-binding activity after lipid A stimulation in macrophages. Nuclear extracts of peritoneal macrophages treated with lipid A or MALP-2 were subjected to EMSA using ISRE found in the IFN-stimulated gene 15 (ISG15) promoter as a probe. As shown in Fig. 2⇓A, ISRE binding was clearly induced after 120 min of stimulation with lipid A. 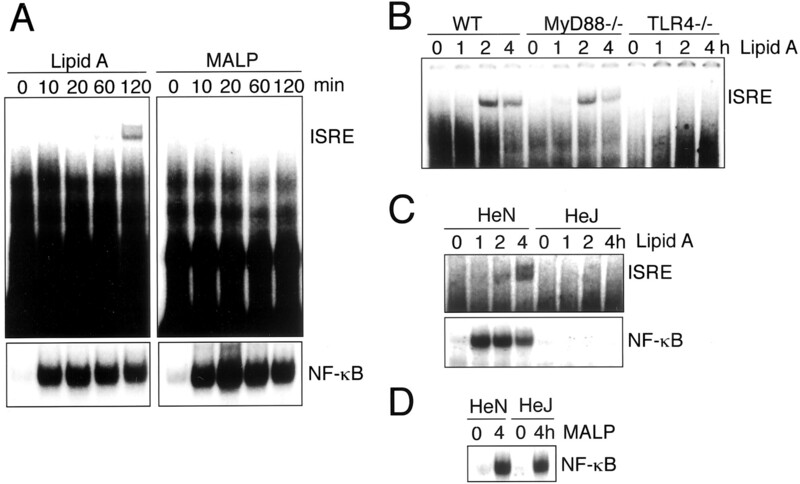 In agreement with Northern blot analysis of IP-10 expression, MALP-2 had no ability to induce ISRE-binding activity. However, NF-κB was significantly activated in the nuclear extract of cells stimulated with either lipid A or MALP-2. These results strongly suggest a possible involvement of ISRE-binding proteins in the induction of IP-10 in TLR4, but not TLR2, signaling. We next tested whether MyD88 is required for ISRE binding after lipid A stimulation. As shown in Fig. 2⇓B, ISRE binding was also induced in MyD88-deficient macrophages as in the case of wild-type macrophages, suggesting that ISRE activation after lipid A stimulation is MyD88-independent. We next examined lipid A-induced NF-κB and ISRE-binding activation in C3H/HeJ mice that are unresponsive to LPS due to a point mutation of proline at 712 to histidine residue in the cytoplasmic region of TLR4 (10, 11). As shown in Fig. 2⇓C, lipid A-induced NF-κB and ISRE-binding activation were completely abolished in C3H/HeJ macrophages, whereas the activity was induced in C3H/HeN macrophages. The possibility that our C3H/HeJ mice might have a defect in NF-κB activation was ruled out because MALP-2-induced NF-κB activation was comparable between C3H/HeN and HeJ macrophages (Fig. 2⇓D). In addition, it was reported that LPS or lipid A-induced IL-6 and IP-10 expression was abolished in C3H/HeJ macrophages (32). These results demonstrate that the proline residue at 712 is critical for activation of both NF-κB and ISRE in TLR4 signaling and for induction of IP-10 as well as of proinflammatory cytokines. Increased ISRE-binding activity in response to lipid A. A, Peritoneal macrophages were treated with 1.0 μg/ml lipid A or 3.0 ng/ml MALP-2 for the indicated period. Nuclear extracts were then prepared and EMSA was performed using ISRE or NF-κB as a probe. B, Nuclear extracts of wild-type, MyD88-deficient, or TLR4-deficient macrophages were prepared after stimulation with 1.0 μg/ml lipid A as indicated. EMSA was performed using ISRE as a probe. C, Peritoneal macrophages from C3H/HeN or C3H/HeJ mice were stimulated with 1.0 μg/ml lipid A for the indicated period. Nuclear extracts were prepared and then ISRE or NF-κB DNA binding activity was monitored by EMSA. D, Peritoneal macrophages from C3H/HeN or C3H/HeJ mice were stimulated with 3.0 ng/ml MALP-2 for 4 h. Nuclear extracts were prepared and then NF-κB activity was monitored by EMSA. IRF-3 is reported to bind ISRE and induce expression of many genes containing this motif including RANTES (35). IRF-3 is also known to be phosphorylated in response to viral infection and DNA-damaging agents (36). Phosphorylated IRF-3 translocates into the nucleus to induce gene expression by associating with coactivator p300/CBP (22, 37). Therefore, we next tested whether or not IRF-3 is activated by TLR4 signaling. As shown in Fig. 3⇓A, lipid A-induced ISRE-binding complex in EMSA was supershifted by adding specific Ab against IRF-3 in both wild-type and MyD88-deficient macrophages, indicating that IRF-3 is responsible for ISRE binding in response to lipid A in a MyD88-independent manner. The anti-IRF-3 Ab did not cross-react with mouse IRF-1, IRF-2, IRF-7, and latent cytosolic transcription factor(ISGF3) γ (data not shown). In addition, the levels of IRF-3 protein expression were not altered by stimulation with LPS in both wild-type and MyD88-deficient macrophages, suggesting that IRF-3 is activated posttranslationally in response to lipid A (data not shown). We also investigated whether or not signaling molecules other than IRF-3 are also involved in ISRE binding after lipid A stimulation. However, we could not detect any supershifted band in EMSA in the extracts incubated with Abs against ISGF3γ, IRF-4, IRF-7, STAT1, STAT2, STAT3, and phosphotyrosine (data not shown). 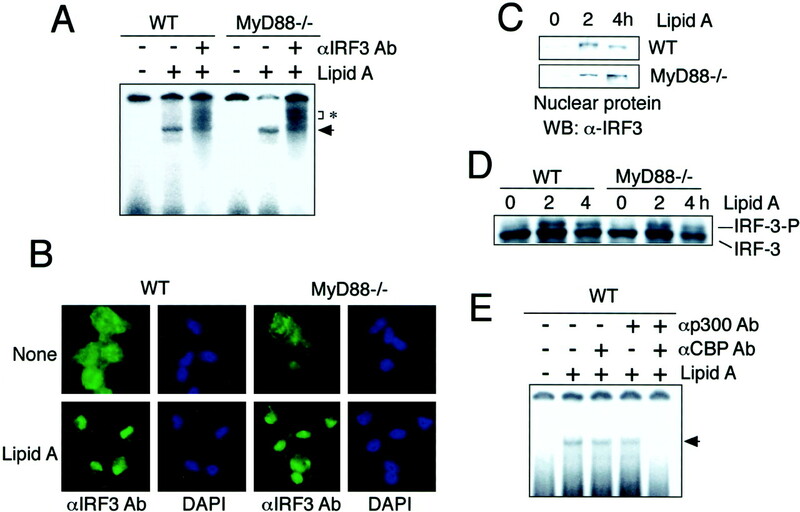 MyD88-independent activation of IRF-3 in response to lipid A. A, Nuclear extracts were prepared after 2 h of stimulation of peritoneal macrophages from wild-type or MyD88-deficient mice with 1.0 μg/ml lipid A. EMSA was performed using nuclear extracts incubated with ISRE probe and anti-IRF-3 Ab as indicated. B, Peritoneal macrophages from wild-type or MyD88-deficient mice were stimulated with 1.0 μg/ml lipid A for 2 h. The cells were stained with anti-IRF-3 Ab together with 4′,6-diamidino-2-phenylindole, and the cellular localization was determined under the conditions of fluorescent light. C, Nuclear extracts used in (B) were separated on SDS-PAGE, and blotted with anti-IRF-3 Ab. D, Peritoneal macrophages from wild-type or MyD88-deficient mice were stimulated with 1.0 μg/ml lipid A for 2 or 4 h. Whole cell lysates were separated on SDS-PAGE and assayed for IRF-3 by Western blot analysis. E, Nuclear extracts prepared from wild-type macrophages stimulated with 1.0 μg/ml LPS were incubated with anti-CBP Ab and/or anti-p300 Ab. EMSA was performed using these nuclear extracts and an ISRE probe. We next determined the cellular localization of IRF-3. Peritoneal macrophages from wild-type and MyD88-deficient mice were stimulated with lipid A for 2 h and stained with anti-IRF-3 Ab. As shown in Fig. 3⇑B, IRF-3 was normally localized in the cytoplasms in both wild-type and MyD88-deficient macrophages. Following lipid A stimulation, IRF-3 protein accumulated in the nuclei in both macrophages. To confirm further, the nuclear extract of lipid A-stimulated macrophages from wild-type and MyD88-deficient mice was immunoblotted with anti-IRF-3 Ab. As shown in Fig. 3⇑C, IRF-3 protein was detected in the nuclear extracts of cells after 2 h of stimulation with lipid A in both wild-type and MyD88-deficient cells, confirming that IRF-3 translocated into the nucleus in response to lipid A.
Phosphorylation of IRF-3 is known to be required for its transcriptional activation. Peritoneal macrophages from wild-type and MyD88-deficient mice were stimulated with lipid A, and mobility shift of the IRF-3 protein on SDS-PAGE was studied by western blot analysis with anti-IRF-3 Ab. As shown in Fig. 3⇑D, IRF-3 protein migrated more slowly on SDS-PAGE in response to lipid A in both wild-type and MyD88-deficient macrophages. Phosphatase treatment of the lysates reduced this mobility shift, indicating that this shift was due to phosphorylation (data not shown). To investigate whether coactivators CBP and p300 are involved in the ISRE-binding complex, we incubated the nuclear extract of lipid A-stimulated cells with anti-CBP Ab and/or anti-p300 Ab before they were subjected to EMSA analysis. The ISRE-binding complex was diminished by adding Abs to the coactivators CBP and p300 (Fig. 3⇑E), indicating that the mixture of CBP/p300 is involved in this complex. Our previous study showed that lipid A-stimulation of MyD88-deficient macrophages resulted in the induction of NF-κB-binding activity with delayed kinetics in EMSA (21). We next examined whether NF-κB translocation is accompanied by IκB degradation. Peritoneal macrophages from wild-type and MyD88-deficient mice were incubated with lipid A, then the cell extracts were prepared and used for Western blot analysis with anti-IκBα Ab. As shown in Fig. 4⇓A. IκBα degraded in 10 min and reappeared 30 min after stimulation. In contrast, the degradation of IκBα was observed with the delayed kinetics in MyD88-deficient macrophages consistent with the kinetics of NF-κB activation. Degradation of IκBβ was also delayed in MyD88-deficient cells (data not shown). However, it is not clear whether NF-κB in MyD88-deficient mice possesses a transcriptional activity. Therefore, we determined by reporter gene assay whether NF-κB activation in MyD88-deficient mice is functional or not. EF cells derived from MyD88-deficient mice also exhibited the induction of the IP-10 gene and the delayed NF-κB DNA-binding in response to lipid A as seen in macrophages (Fig. 5⇓C). Therefore, we used these cells to perform the reporter gene assay. EF cells were transiently transfected with NF-κB reporter gene plasmid, and then stimulated with lipid A, MALP-2, TNF-α, and IL-1β. As shown in Fig. 4⇓B, NF-κB-driven reporter gene expression was stimulated in response to lipid A in both wild-type and MyD88-deficient cells. In contrast, activation of NF-κB was not observed in MyD88-deficient cells in response to MALP-2 and IL-1β, being consistent with the results obtained from EMSA. TNF-α-stimulated NF-κB activation was comparable between wild-type and MyD88-deficient cells. These results indicate that lipid A-mediated NF-κB activation in MyD88-deficient macrophages is also functional. It was shown that there are typical ISRE and adjacent NF-κB-binding sites in the promoter region of the IP-10 gene, and both sites were required for induction of IP-10 (34). We next used PDTC, a potent inhibitor for NF-κB, to investigate its affect on induction of the IP-10 gene. Peritoneal macrophages were pretreated with PDTC for 1 h and stimulated with lipid A for 4 h. As shown in Fig. 4⇓C, induction of IP-10 mRNA was impaired by treatment with PDTC in both wild-type and MyD88-deficient macrophages. Whereas this reagent decreased lipid A-induced NF-κB activation in EMSA, it did not affect the nuclear translocation of IRF-3 (Fig. 4⇓D), indicating that lipid A-induced IRF-3 activation occurs independent of NF-κB translocation. 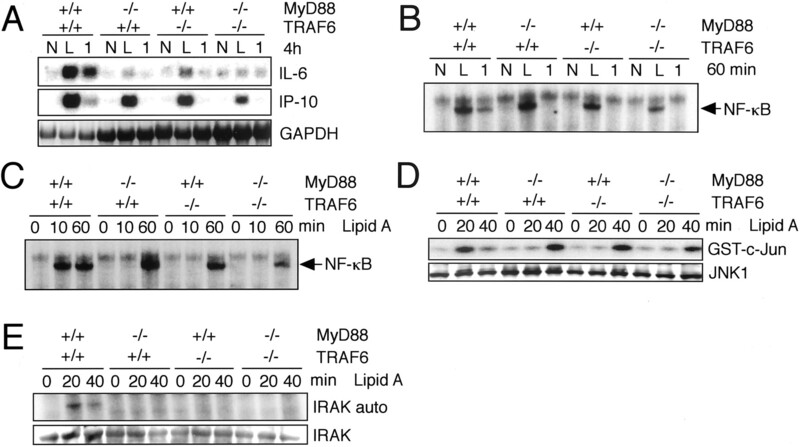 Taken together, these results indicate that the delayed activation of NF-κB observed in MyD88-deficient cells is functional and suggest that NF-κB activation is required for IP-10 gene induction in response to lipid A.
Functional activation of NF-κB in MyD88-deficient cells in response to lipid A. A, Peritoneal macrophages from wild-type and MyD88-deficient mice were stimulated with 1.0 μg/ml lipid A for the indicated period followed by Western blot analysis with anti-IκBα specific Ab. B, Embryonic fibroblasts from wild-type and MyD88-deficient mice were transiently transfected with 1.0 μg NF-κB-dependent reporter gene plasmid. After 12 h, cells were stimulated with 1.0 μg/ml lipid A, 30 ng/ml MALP-2, 10 ng/ml IL-1β, or 10 ng/ml TNF-α. Relative luciferase activity was determined after 24 h. C, Peritoneal macrophages were treated or left untreated with 10 μM PDTC for 1 h, and then stimulated with lipid A for 4 h. Five micrograms of total RNA were subjected to Northern blot analysis for expression of IP-10. A GAPDH probe was used as an internal control. D, Peritoneal macrophages pretreated with PDTC for 1 h were stimulated with lipid A for 2 h. Nuclear extracts were analyzed for activation of NF-κB and IRF-3 by EMSA and Western blot analysis, respectively. MyD88- and TRAF6-independent induction of the IP-10 gene and activation of NF-κB and JNK. A, EF cells derived from wild-type, MyD88-deficient, TRAF6-deficient, and MyD88- and TRAF6-deficient mice were stimulated with 100 ng/ml lipid A (L) or 10 ng/ml IL-1β (1 ) for 4 h. Expression of IL-6 and IP-10 was analyzed by Northern blot. GAPDH was used as a control. B, EF cells were stimulated with 100 ng/ml lipid A (L) or 10 ng/ml IL-1β (1 ) for 60 min. NF-κB DNA-binding activity was analyzed by EMSA. C, EF cells were stimulated with 100 ng/ml lipid A for 10 or 60 min. NF-κB DNA-binding activity was analyzed by EMSA. D, EF cells were stimulated with 100 ng/ml lipid A for 20 or 40 min. Cell lysates were immunoprecipitated with anti-JNK1 Ab. JNK activity was analyzed by in vitro kinase assay with GST-c-Jun as the substrate (upper). Expression of JNK1 was analyzed by Western blot with anti-JNK1 Ab (lower). E, EF cells were stimulated with 100 ng/ml lipid A for 20 or 40 min. Cell lysates were immunoprecipitated with anti-IRAK Ab. IRAK activation was analyzed by in vitro kinase (upper). Expression of IRAK was analyzed by Western blot with anti-JNK Ab (lower). Auto, autophosphorylation. We next tested whether or not TRAF6 is also involved in a MyD88-independent pathway. EF cells derived from wild-type, MyD88-deficient, TRAF6-deficient, and MyD88/TRAF6-doubly deficient mice were stimulated with lipid A or IL-1β for 4 h and subjected to the expression of IP-10 and IL-6. Induction of IL-6 in response to lipid A or IL-1β was impaired in MyD88-, TRAF6-, and MyD88/TRAF6-deficient cells, whereas IP-10 was significantly induced in response to lipid A in a MyD88/TRAF6-independent manner (Fig. 5⇑A). In contrast, IL-1β had no ability to induce IP-10 in wild-type cells (Fig. 5⇑A). We next investigated activation of NF-κB in response to lipid A or IL-1β. As shown in Fig. 5⇑B, NF-κB was activated in response to lipid A in cells lacking MyD88, TRAF6, and MyD88/TRAF6. In contrast, stimulation with IL-1β failed to activate NF-κB in these cells. Because lipid A-induced NF-κB activation was delayed in MyD88-deficient macrophages, we next performed time-course analysis using EF cells. As shown in Fig. 5⇑C, NF-κB was activated at 10 min of stimulation in wild-type cells but not in cells lacking MyD88, TRAF6, and MyD88/TRAF6. At 60 min stimulation, NF-κB was activated in all types of cells. Furthermore, activation of JNK in response to lipid A was also delayed in MyD88-, TRAF6-, and MyD88/TRAF6-deficient EF cells (Fig. 5⇑D). The activation of other MAP kinases, such as extracellular signal-related kinase and p38, was also delayed in these cells (data not shown). We next investigated the activation of IRAK in response to lipid A. Consistent with our previous report using macrophages, activation of IRAK was completely abolished in MyD88-deficient EF cells. Surprisingly, IRAK activation was also impaired in TRAF6- and MyD88/TRAF6-deficient cells (Fig. 5⇑E). This result indicates that activation of IRAK is dependent on both MyD88 and TRAF6 in EF cells. Taken together, the delayed activation of NF-κB and MAP kinases and the expression of IP-10 in response to lipid A occur through MyD88- and TRAF6-independent mechanisms. Our previous study with MyD88-deficient mice revealed the existence of MyD88-dependent and -independent pathways in LPS signaling (21). MyD88-deficient cells failed to produce any inflammatory cytokines such as IL-1β, IL-6, and TNF-α in response to LPS. Nevertheless, activation of NF-κB and MAP kinases was observed in LPS-stimulated MyD88-deficient cells with the delayed kinetics. For the present, the nature and role of the MyD88-independent pathway are not well understood. In this study, we demonstrated that LPS activates IRF-3 and induces expression of a subset of LPS-inducible genes in a MyD88-independent manner. IRF-3 was originally identified as a member of the IRF family that binds to the ISRE of the ISG15 (24, 38). The IRF-3 protein is ubiquitously present in a variety of tissues and phosphorylated in response to viral infection, dsRNA treatment, or DNA-damaging agents (22, 36, 37, 39). 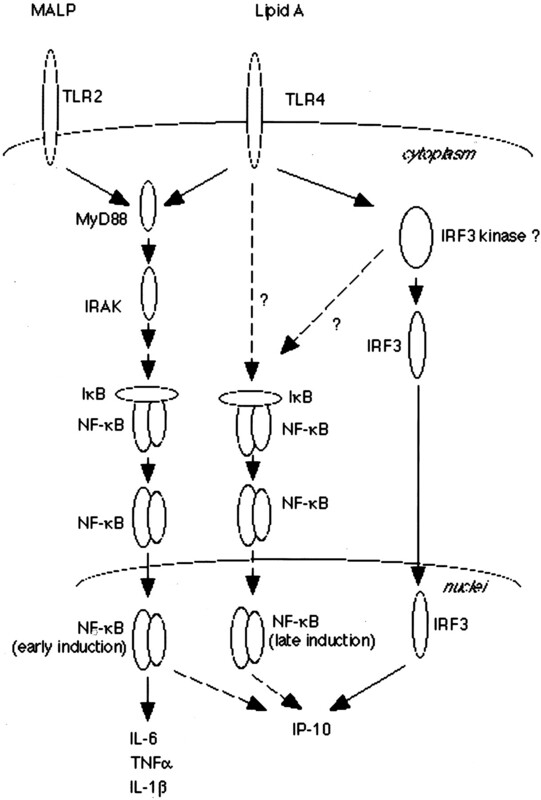 Phosphorylated IRF-3 then translocates to the nucleus, associates with the p300/CBP coactivator, and binds to the ISRE, which results in induction of several IFN-regulated genes. Recently, it has been reported that virus-induced IP-10 induction is dependent on IRF-3 and ISGF3 (40). It has been shown that IRF-3 also translocates to the nucleus upon stimulation with LPS in a human astrocytoma cell line (41). In the present study, we demonstrated that IRF-3 translocates to the nucleus in response to LPS in MyD88-deficient macrophages as well as wild-type macrophages. MyD88-deficient macrophages responded to LPS to induce IFN-regulated genes to similar extents as those of wild-type macrophages, indicating that LPS activation of IRF-3 is MyD88-independent. In contrast, induction of IL-6, IL-1β, and TNF-α mRNA in response to LPS was dramatically reduced in MyD88-deficient macrophages. Furthermore, lipid A-induction of COX-2 mRNA was completely abolished in MyD88-deficient macrophages. Thus, it appears that LPS activates at least two signaling pathways to induce different subsets of genes; the MyD88-dependent pathway regulates expression of IL-6, IL-1β, TNF-α, and COX-2, whereas the MyD88-independent pathway regulates expression of IFN-regulated genes such as IP-10, GARG16, and IRG-1, possibly through coordinate action of IRF-3 and NF-κB. Although we used the ISG15 ISRE in all of our IRF-3 binding studies, we recognize that this does not imply that IRF-3 will bind to ISREs derived from the three genes identified by subtractive hybridization. Because our present study does not show any direct involvement of IRF-3 in LPS-induced IP-10, GARG16, or IRG-1 gene expression, further study will be required to ascertain this point. The finding that MyD88-deficient mice, but not TLR4-deficient and C3H/HeJ mice, could activate both NF-κB and IRF-3 as well as the IP-10 gene in response to LPS or Taxol indicates that the MyD88-independent pathway originates from the cytoplasmic portion of TLR4. In contrast, TLR2-dependent stimuli, such as MALP-2, failed to activate IRF-3 and induce IP-10, which is consistent with our previous finding that MALP-2-mediated activation of NF-κB and MAP kinases is completely abolished in MyD88-deficient cells. Consistent with our result, Hirschfeld et al. (42) recently showed that macrophage stimulation by Porphyromonas gingivalis LPS preparation, a potent TLR2 ligand, resulted in diminished IP-10 expression compared with stimulation by E. coli LPS. Taken together, these findings show that TLR2 activates NF-κB and MAP kinases only through the MyD88-dependent pathway as is the case with the IL-1R family, whereas TLR4 activates NF-κB and MAP kinases through MyD88-dependent and -independent pathways (Fig. 6⇓). Model of the signaling pathways through TLR2 and TLR4. See text for detail. Recently, Perera et al. (43) showed that LPS-induced gene expression of COX-2 and IL-12, but not of TNF-α and IP-10, was diminished in CD11b/CD18-deficient macrophages . These results suggest that there are different mechanisms in the regulation of the these genes in response to LPS. The genes affected by CD11b/CD18 were induced by the MyD88-dependent pathway, implying that the MyD88-dependent pathway may be modulated by CD11b/CD18. How does LPS activate NF-κB, MAP kinases, and IRF-3 in a MyD88-independent manner? TRAF6 is a candidate that participates in the MyD88-independent pathway as it has the ability to activate NF-κB and MAP kinases by associating IRAK, and TRAF6-deficient cells are defective in activating NF-κB by IL-1 (17, 44, 45). However, induction of IP-10 and activation of NF-κB and JNK were observed in response to lipid A but not IL-1β in TRAF6-deficient fibroblast cells, as seen in MyD88-deficient cells. Furthermore, MyD88/TRAF6-doubly deficient cells also responded to lipid A by inducing the IP-10 gene and activating NF-κB and JNK. Taken together, TRAF6 is dispensable for LPS-mediated induction of IP-10 and activation of NF-κB and the MyD88-independent pathway in TLR4 signaling integrates at a level downstream of TRAF6, ultimately leading to the activation of NF-κB and MAP kinases (Fig. 6⇑). Previous reports have indicated that TRAF6 acts downstream to IRAK (15, 16). However, we showed in this study that lipid A-induced activation of IRAK was completely abolished in TRAF6-deficient mice. This observation demonstrates that IRAK activation completely depends on both MyD88 and TRAF6. Other than TRAF6, LPS is known to activate a number of signaling molecules that include protein kinase C, src-type tyrosine kinases, small G protein, PI3K, Akt, TAK1, and double-stranded RNA-dependent protein kinase, all of which are reported to have abilities to activate NF-κB (46, 47, 48, 49, 50, 51, 52). It is possible that these molecules are involved in the MyD88-independent pathway leading to NF-κB and IRF-3 activation in response to LPS. In summary, we showed in this study that IRF-3 can be activated in response to LPS in a MyD88-independent manner. 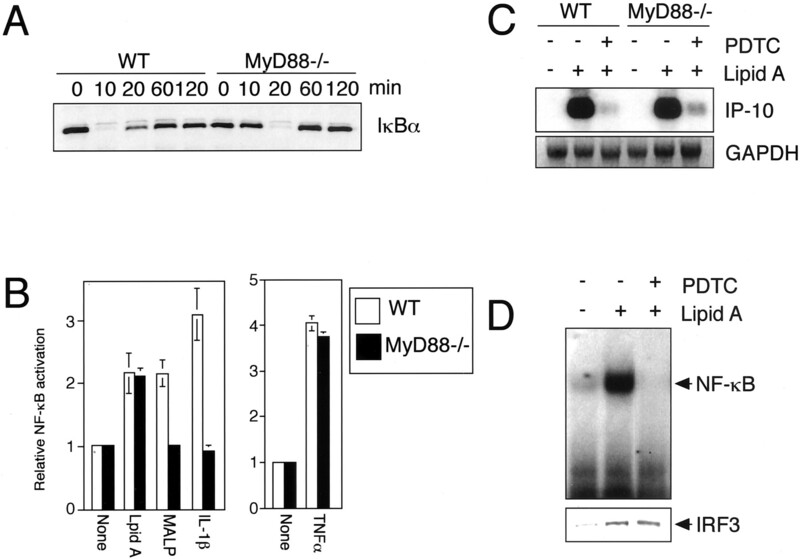 The MyD88-dependent pathway regulates expression of genes encoding inflammatory cytokines, whereas the MyD88-independent pathway regulates a subset of LPS-inducible genes that have been previously reported to be IFN-inducible. In contrast, TLR2 failed to induce the IP-10 gene. Given that TLR4, but not TLR2, also activates NF-κB in a MyD88-independent mechanism, it is possible that TLR4 specifically uses an unknown molecule other than MyD88 for its signaling to both NF-κB and IRF-3. Future research on identification of such a molecule may clarify its precise mechanism on the signaling cascade triggered by the TLR family, especially TLR4. We thank members of the Akira laboratory for helpful discussion and support. We also thank T. Yasui (Research Institute for Microbial Diseases, Osaka University, Osaka, Japan) for microscopy analysis. ↵1 This work was supported by grants from the Ministry of Education of Japan. T.K. and O.T. are supported by a postdoctoral fellowship from the Japan Society for the Promotion of Science. ↵3 Abbreviations used in this paper: PAMP, pathogen-associated molecular pattern; TLR, Toll-like receptor; IRAK, IL-1R-associated kinase; TRAF, TNFR-associated factor; MAP, mitogen-activated protein; MALP-2, macrophage-activating lipopeptide-2 kDa; JNK, c-Jun N-terminal kinase; IRF, IFN regulatory factor; CBP, CREB-binding protein; PDTC, pyrrolidine dithiocarbamate; EF, embryonic fibroblast; ISRE, IFN-stimulated regulatory element; COX, cyclooxygenase; IP-10, IFN-γ-inducible protein 10; GARG, glucocorticoid attenuated response gene; IRG1, immune-responsive gene 1; ISGF3, latent cytosolic transcription factor.